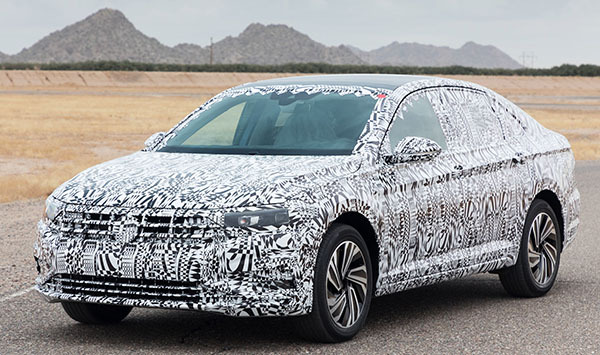 More official teasers of the new Jetta for 2019. This time they look pretty ridiculously exaggerated. Which is too bad. I am sure it is a decent looking sedan. But it will be quite disappointing next to these illustrations. I do like theinteriror . The dashboard seems really modern with the screen well integrated. No weird cheap looking tablet here. And here is the real thing. Sure, still covered in camouflage. But you can at least see the proportions, which are nothing like the illustrations above. Not an interesting line on this car. If this car had come out when the existing model did in 2011 it still would have been boring. Yeah, you get these silly concept sketches, longish, and flowing, and....you get the one at the bottom.